With the upcoming release of the Imperial Agents codex from Games Workshop, and all the hullabaloo surrounding it (mainly due to the inclusion of the Sisters of Battle), I thought I’d do a little digging and see just what all the fuss is about, then share that fuss here with you all! I’ve not been in the game as long as many folks, of course, though I feel it’s long enough to get a general grasp of what’s going on in the world! But feel free to take the rest of this blog with however much scepticism you feel is appropriate! Seems that a lot of the love for Sisters of Battle dates to the heady days of Second Edition, back in 1993, when the game was focused on smaller-scale games. The Codex for Sisters of Battle dropped in 1997, and was followed in the following year by Third Edition. Throughout the subsequent years and editions, Sisters of Battle have had a weird short-change in terms of getting Codex updates, being rolled into the Codex: Witch Hunters for Third Edition in 2003, then a two-part feature in White Dwarf in 2011 for Fifth Edition, followed by their digital Codex for Sixth Edition in 2013, again right before Seventh Edition launched a year later. If the rumours are right for Eighth Edition coming in 2017, then the inclusion of Sisters of Battle in this year’s Codex: Imperial Agents seems right on the money. Codices have been slower than some factions, but they’ve certainly been there. There have been about as many distinct Sisters codices as there have for my beloved Necrons (who have had their own book in Third, Fifth and Seventh Editions), so all of the disappointment can’t really stem from a lack of availability, surely? Perhaps it’s more accurate to think of the disappointment coming more from the power level. I can’t really talk about that because I’m not a power-gamer – I much prefer to use games as a vehicle for having fun, not to demand the game entertains me on its own. To that end, I’d gladly play with a fifth-rate codex if it meant I could forge some hilarious narratives as I get gunned down en masse. A lot of the complaints that I read – particularly from the always-entertaining Bell of Lost Souls comments – seem to paint this picture of a distinct lack of power in the Sisters codex, however. But that attitude seems to be prevalent a lot online, with players talking in terms of tournaments and the like (if indeed they are players at all). However, it does seem unfair when there is a Codex: Space Marines in every edition, with multiple chapters getting their own individual book alongside this. Games Workshop has its own priorities, naturally, and they seem to be centred around Space Marines when it comes to Warhammer 40k. Which I think is fine, really. I mean, I’m relatively okay because Necrons have had an update for the current edition, and a pretty powerful one at that, and I’ve also been collecting Space Marines for a while. But Space Marines are the iconic warriors of this setting more than anything, and that’s how Games Workshop wants it. It’s their setting, so that’s fine. I think a lot of people get mad at GW because they aren’t being personally catered for, but when you think how many people play this game, and how many options there are within it, I think that becomes a little silly. However, there is something else that I’ve been overlooking during the course of this ramble, and that is the miniatures themselves. The original line of Sisters miniatures was released for their Second Edition Codex in 1997, and has seen a re-release in 2004 to tie-in with their Third Edition Witch Hunters amalgamation. The entire range was first put out in metal, and is still metal. There is no other range of Warhammer 40k figures with this problem – even though a lot of the Astra Militarum figures are still metal, they have some pretty decent plastics now. While there’s still a lot of finecast stuff around, a lot of armies can field all-plastic miniatures, while the Sisters are left in metal. Given the fact that plastic is much easier to work with than metal if you’re new to the hobby, I can’t see these old metals bringing in many new people any time soon. There’s also the issue of price. To get a ten-woman battle squad will cost you £50, which will cost you just 120 points to field, un-upgraded. 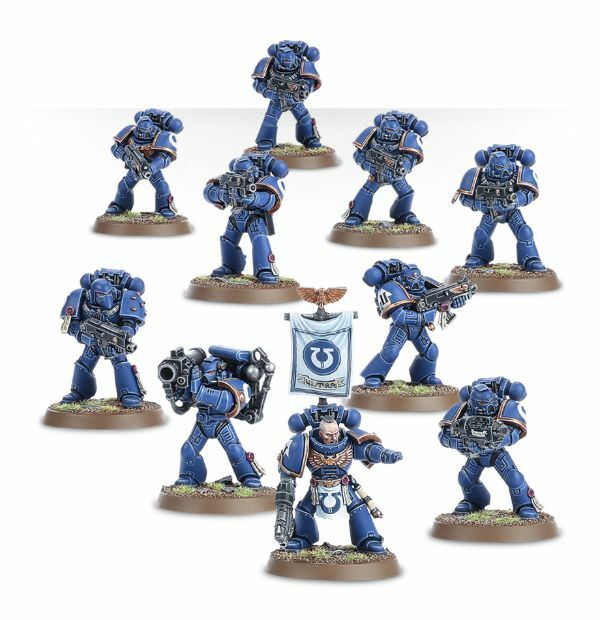 To get the minimum combined-arms detatchment of one HQ and two troops choices will cost you £58.20 (pairing the ten-woman squad with a Canoness), while you can field a Space Marines force with the same CAD for £39 (getting the ten-man tactical squad and a fancy commander), not to mention the sheer variety of weapons options and upgrades you can give to the marines thanks to the spare bits in those kits. An entire army of Sisters is therefore going to cost about a third more than a Marines army, if we extrapolate upwards from that – again, not a good way to get new folks into the hobby. So we have an army that is old in terms of miniatures, and comparatively old in terms of rules. Those rules are also purported to be under-powered, though I suppose that partially depends on who you are as a gamer. Added to this mix is the price, but also, an extremely vocal fan base for the Sisters. 2015 saw the release of Harlequins and Cult Mechanicus as distinct armies within the Warhammer 40k line, and 2016 has continued this with Deathwatch and Genestealer Cults. All four of these armies are highly iconic, and hold some incredible nostalgia for fans of the game from the 1990s. 2016 has also seen the release of two codex supplements, Angels of Death and Traitor Legions, which give incredible individuality and diversity to the Space Marines who don’t have separate chapter codices, and the Chaos Space Marines. All of this shows how keen GW are to provide more options for players who want to field some really individual armies, and therefore I don’t believe there is any kind of malice directed towards Sisters players. In all honesty, I think people who think that are projecting their own childishness onto the company. GW exists to make money, and no matter how much it may seem like they do, I don’t believe they’re unaware of the interest players have in playing Sisters of Battle. 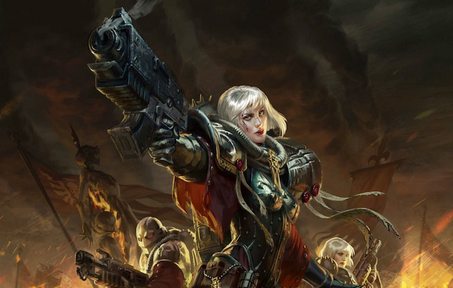 If you go along with the adage of, for every one person who shouts about it, there are ten who silently hold the same opinion, then I would say that interest in the Adepta Sororitas is high indeed. There are a few convincing arguments that I’ve heard for the lack of plastic Sisters, and thought I’d share them here before I finish. First of all, there has been talk of these plastic girls for years – I can remember hearing of folks “who know a guy whose brother-in-law’s best friend’s cousin has seen the plastic Sisters, and they’re awesome!” and so forth, back when I was first hanging around GW stores in 2014. 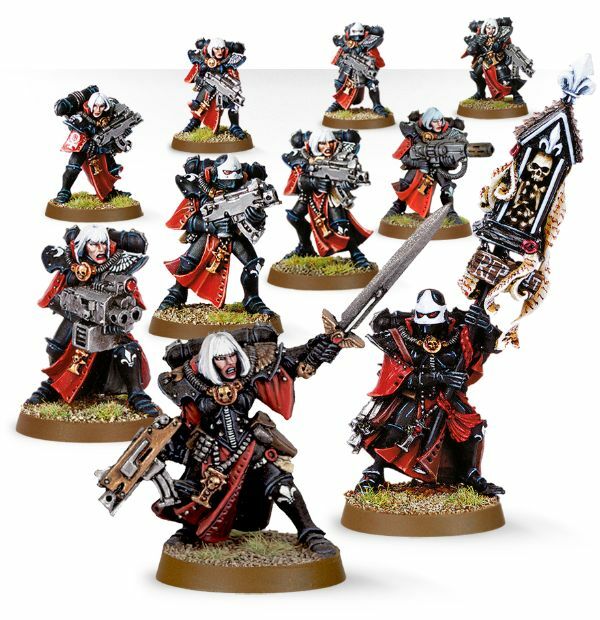 There has been mention of them needing to perfect the moulds for particularly delicate models clad in robes, and the Skitarii models have shown that such technology now exists (not to mention, some of those Harlequin models). There are, of course, the Seraphim Squad that look really weird in today’s miniatures ranges, being suspended above the ground from black metal rods rather than clear plastic flying base-type things, and such things would need a drastic make-over to be in keeping with the modern range. But looking at some of the things they’ve put out in recent years, from the Harlequins and Assassins to the level of detail on the Genestealer Cults and the Thousand Sons, it really does seem like the technology is there to create these miniatures now. In that sense, then, I’m choosing to believe that the plastic Sisters of Battle really are around the corner, hopefully in Q1 of 2017, and this current release of the metal models is merely an effort to clear out the existing stock and allow collectors of the older minis to grab some more before the complete overhaul. The power of positive thought, people! Pingback: So much Warhammer news! Pingback: Games Workshop previews and reveals! Next Next post: Against the Shadow!